[Update] 4:20 PM EST: Added better quality images of the cards and gameboard. The Curse of Naxxramas will be the first adventure mode released in Hearthstone. It was announced today at PAX East and will contain 30 new cards, a new adventure specific game board, and class challenges. The adventure will release one wing each week, with a total of five wings. The first wing will be free for everyone and the remaining four will be purchasable with either your in-game gold or real money. Get saving! 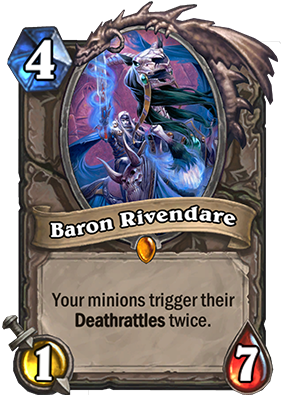 Baron Rivendare: 4 Mana / 1 Attack / 7 Health - Your minions trigger their Deathrattles twice. 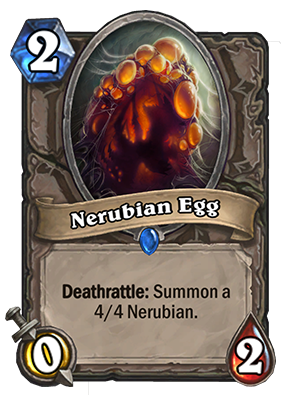 Nerubian Egg: 2 Mana / 0 Attack / 2 Health - Deathrattle: Summon a 4/4 Nerubian. 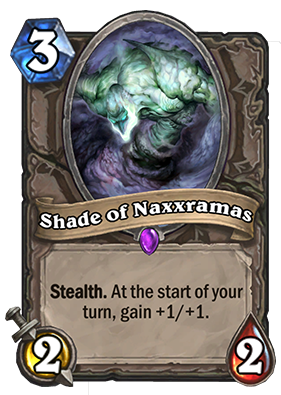 Shade of Naxxramas: 3 Mana / 2 Attack / 2 Health - Stealth. At the start of your turn, gain +1 / +1. 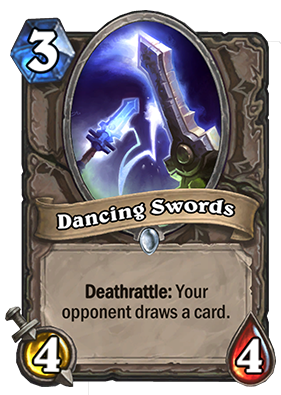 Dancing Swords: Deathrattle: Your opponent draws a card. A gameboard is being added which is specific to the adventure itself. Each corner represents one of the different quarters of Naxxramas! So what exactly is an "adventure mode". How much gold will it cost to open stuff in Adventure mode? Much more than arena or? Just tell me, is it possible to earn for one wing (assuming thats what we open) in one week? I need to know when to start saving. Are the wings a one-time buy or each run like arena? So is adventure mode the only way to get these new cards or can people craft them as well? Great adventure theme :) when it will come live? Thanks. 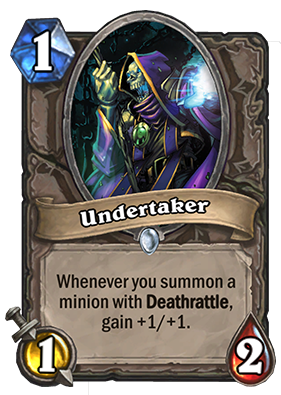 How will the Undertaker card work with cards that grant Deathrattle effects like Soul of the Forest? How can you obtain gold versions of those? Hearthstone’s highly anticipated single player Adventure Mode has been officially announced today at PAX East: Curse of Naxxramas, A Hearthstone Adventure! Progressing through Curse of Naxxramas and overcoming the challenges that lurk within will reward you with all new Hearthstone cards! Once you earn these cards, you can start playing with them in your decks right away. A total of 30 new cards will be added with Curse of Naxxramas - Check out a few of the shambling creatures of the undead that are justdying to be a part of your collection below! 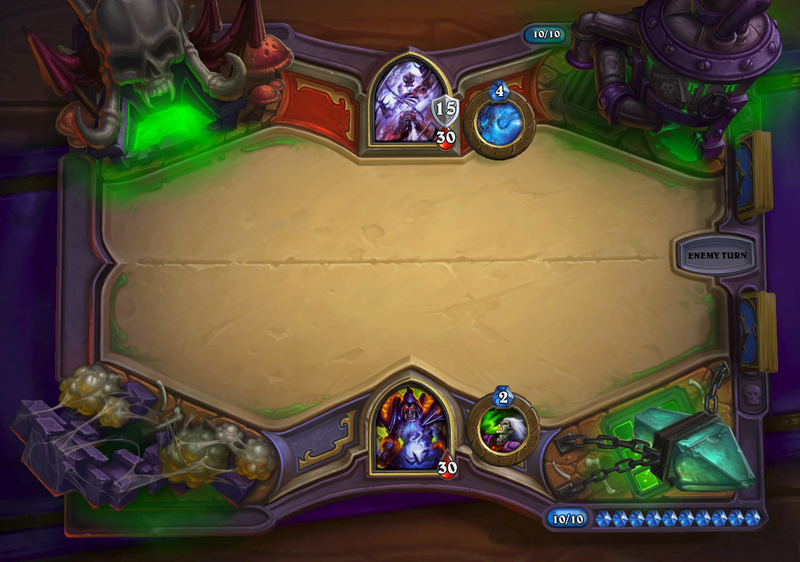 Curse of Naxxramas will have its own unique game board Hearthstone players battle on while they are in the adventure, complete with brand new interactive corners! What could possibly lurk within that quivering mass of eggs? Do you really want to find out? 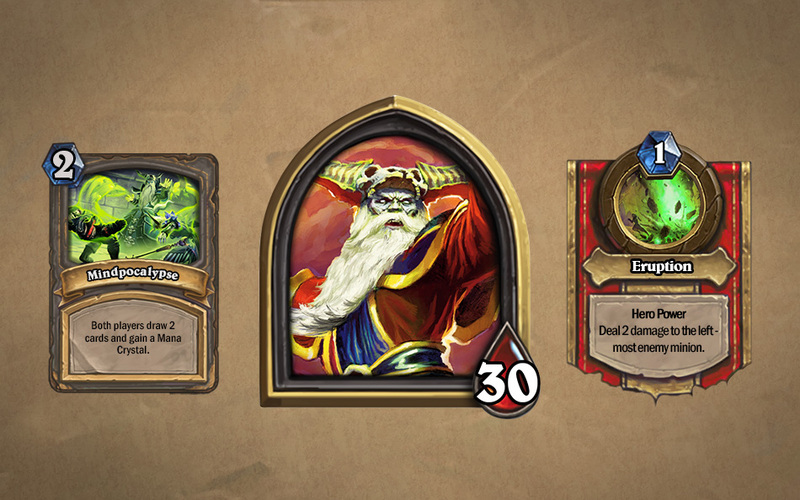 We hope you enjoyed this first look into Curse of Naxxramas, A Hearthstone Adventure. Curse of Naxxramas is planned to release simultaneously for PC, Mac and iPad. A release date will be announced at a later time. It was announced that there would be a full iPad release in 1-2 weeks. Yay! Somebo--I say somebody said "release in 1-2 weeks"?! When was this announced?! Is the PC version coming out with it?! How much gold does it require, I wonder. Has NE1 learned if the 30 new cards of NAXX are all loot drops and the class specific cards are on top of that or part of those said 30...???? Shade is beyond broken in Shaman decks. Rivendare may or not be. That card is excellent in any deck. Both late game control, and minion heavy rush decks. Ask yourselves this. If everyone has access to overpowered cards, then are they really overpowered? Wouldn't it just be par at that point? If these cards are guaranteed, it sounds like a good idea. If it's just like packs where you cross your fingers and just keep getting the same five cards that you're dusting every time, then it's even worse than what the game offers now. I personally couldn't care less about OP cards of useless cards. I'm sure they will all be tweaked if needed soon after release (blizzard has a pretty balanced game, i'm sure they don't want to screw with it by adding 30+ overpowered cards). But you can't help to just love the possible egg utility or the possible baron combos. Can this game get any more disappointing? Neutral cards are already diluting the potential quality of this game, why are you adding more? Dual weild ash bringer maybe? It's about time Ancestral Spirit gets a buff. I think we'll soon see why it was nerfed. 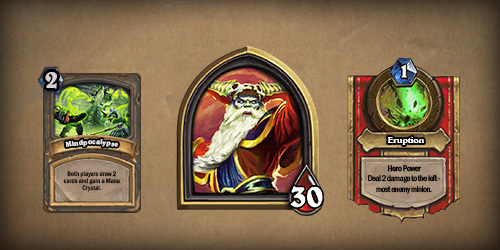 It has been confirmed that each boss will 'drop' a card. The rest, who knows. 1) since we have to buy the content, will it have replay value? can i run it again for fun? 2) will it have multiple difficulty levels? (again replay value)? god damnit I spent 1000 gold yesterday !